Sykes House Farm smoky bacon mash potato, collard greens, corn & chilli salsa. For the partridge, melt the molasses and maple syrup together and add the star anise. Add the orange zest, juice, soya sauce and tomato puree. When cooled marinade the partridge. To cook place on the chargrill, skin side down and grill the bird gently until cooked, this will take between 8 and 10 minutes. To make the mashed potato, peel and cut the potatoes into chunks and cook in cold water until soft. Drain and place back on the heat to cook out and remove excess moisture. Mash using a potato masher adding butter, milk, salt and pepper. Pan fry the bacon pieces and add to the mash potatoes. Mix well. Blanch the leaves in boiling water and refresh in iced water. Reheat in butter and season. For the salsa, sear the corn on the cob on a griddle in oil and a little butter until lightly cooked. Shave off the corn on the cob into a bowl. Remove skins from the tomatoes by blanching in boiling water then refresh in iced water. Cut the tomatoes into four, remove the seeds and discard the centre. Dice the tomatoes and add to the corn. Pour over Yorkshire rapeseed oil. Add lime zest and juice, coriander and sea salt. Add chilli and mix all together. 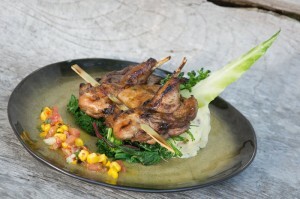 Place the partridge on the mash and the greens, spoon the salsa on the plate and serve.